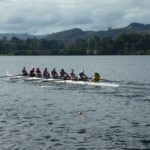 A successful Legion regatta was held on Karapiro Lake in April 2018, 258 rowers participated in the regatta which produced a small profit of $395 that will be used as a contribution towards the Junior Rower Awards. This year, the Legion increased the value of the Junior Trust Awards so that each was valued at $1,500 (increased from $750 in 2017). There was a huge increase with 16 applications for the four awards. 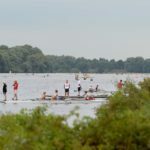 In addition, a sum of $1500 was made available to be allocated at the discretion of the rowing coaches to Junior rowers who could benefit from additional financial support. Two rowers were nominated and each received $750 each, they will remain anonymous. In all the written and verbal communications we clearly described to the Junior rowers that the award funding had been raised by the Legion of Rowers who represent the masters rowing community and past rowers (many of whom represented New Zealand), to support their rowing endeavours. They were also gifted some specially designed New Zealand rowing pins to swap or wear as they travelled overseas. The Legion initiated an “Away weekend” at Labour weekend which is designed for masters to be able to visit another region and have the chance to row and socialise with the local rowing community. Last year 15 rowers went to Whakatane and enjoyed walking, rowing and socialising together. The plan for Labour weekend 2018 is to visit the Hawkes Bay – more information will be made available through the Legion newsletters. The Legion is an incorporated society that depends on membership and donations to fund its activities. It is run by a volunteer committee which consists of many of the regatta officials. Membership has increased over the past three years from 81 to 123 and in the current year (Apr 18 to Mar 19) we have 158 members. Donations are about $1000 each year. The funding is used primarily to support the Junior Rowers.